It is very cold and windy here at 1922 Starkey House Bed & Breakfast. My wild imagination is allowing me to look around the grounds, now covered with snow and ice, to go to the place called my Hummingbird Habitat. Just a few simple steps will create the necessary plantings and environment to invite those cute little creatures to find nectar and show off their intriguing beauty. I think my guests will delight in the opportunity to walk around the gardens and sit to take in the fragrances, sights, and sounds. I have put out hummingbird feeders before. I have tried the store varieties with ready made sugary mixtures and have explored the idea of offering them a homemade variety of food source. But I never really planted specific flowers or bushes that would attract them. So, I have taken some time to investigate what the steps would be that are necessary to create an actual garden that is specifically dedicated to hummingbirds. Whenever a hummingbird buzzes by, I wonder if they are really birds or some sort of beautiful bug. 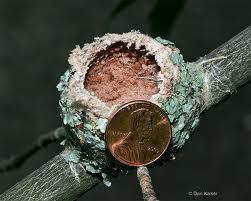 Their nests are so tiny and their eggs so precious and small. I have learned that, although they are tiny, they survive quite well in their environment and their migration patterns are remarkable. 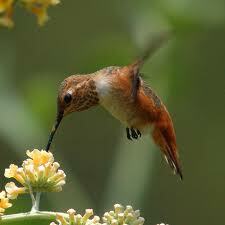 Hummingbirds, like bees, and butterflies are attracted to flowers that contain nectar. While bees bring the pollen and nectar back to their hives in order to manufacture it into honey, Hummingbirds and butterflies use the nectar for food. Hummingbirds are a "specialized nectavore" that must eat the juicy, sweet nectar from blossoms containing at least 10% sugar content. They reject other types of flower blooms that do not contain higher concentrations of sucrose. So much for low-sugar diets! Please stay tuned and follow the next three posts on the lives and habitats of these beautiful little creatures! Meanwhile, take a look at this remarkable video by Scott Kemp, photographer in Alaska. Although this was filmed in Alaska, the Rufus Hummingbird does visit here in the Finger Lakes too. Will we be able to have them feed right out of our hands?